It gets to be big and bold and exclamation marked in this sub-heading because it’s the first game we’ve managed to cross off our list of Games We Want, which is a noteworthy achievement in the limited history of this blog. Fanorona is also notable as having been bought to the attention of many through the PS3 and Xbox 360 game Assassins Creed III where you can play it as a mini game within the game along with Nine, Six, Three and Twelve Mens Morris. Fanorona is currently down as the quickest game I’ve ever played, and that’s not only because I’m terrible at it (but better than my brother at the moment). It’s for two players and played on a rectangular board. 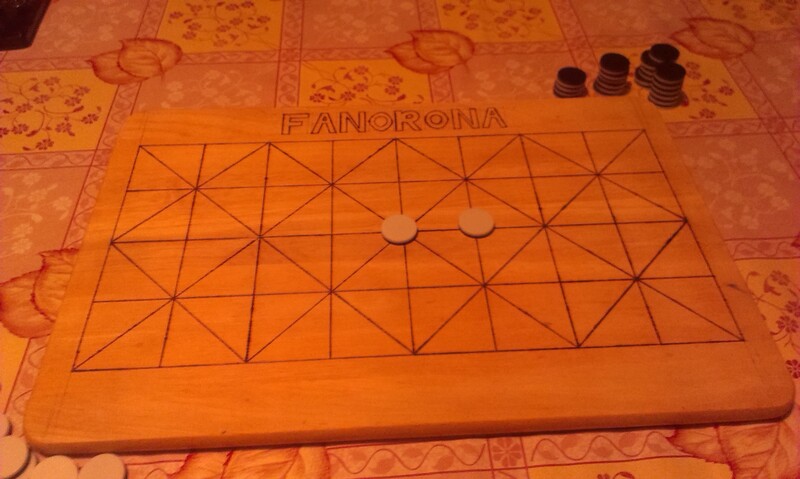 Our home made Fanorona board. 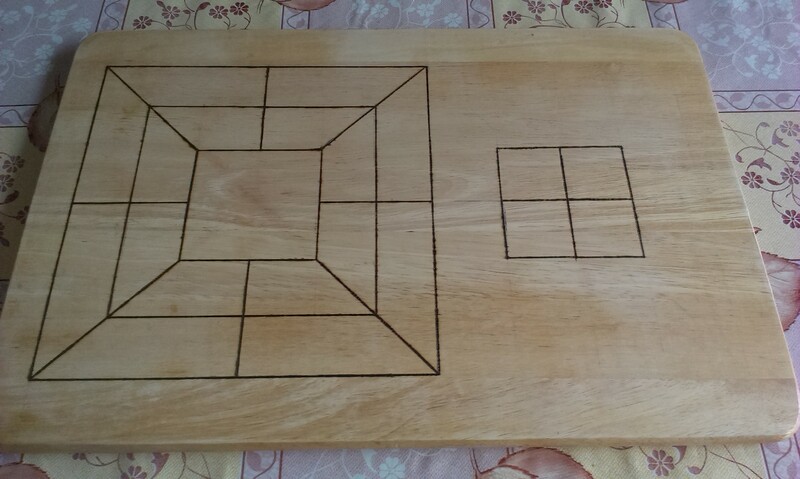 Made on a chopping board using a soldering iron to brand the markings into the wood. 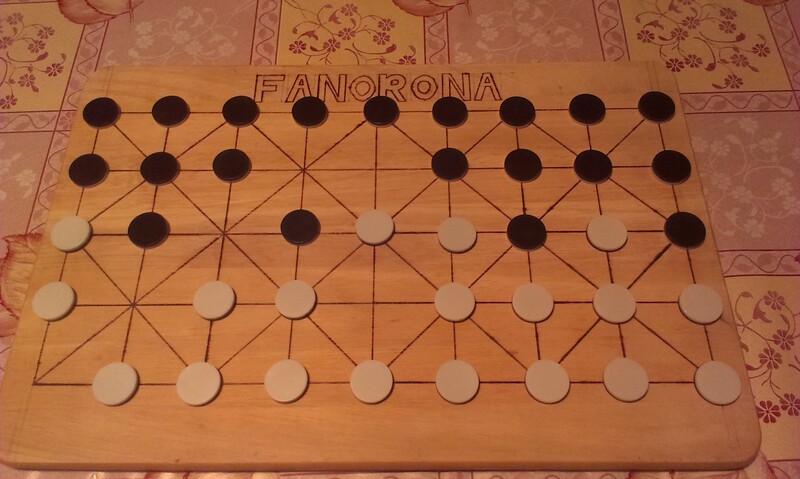 This is where I organize all the interesting stuff I found out about Fanorona, if you don’t want to read about the history of the game, skip down a bit and see more pictures of us playing and a bit about the rules and how to move! 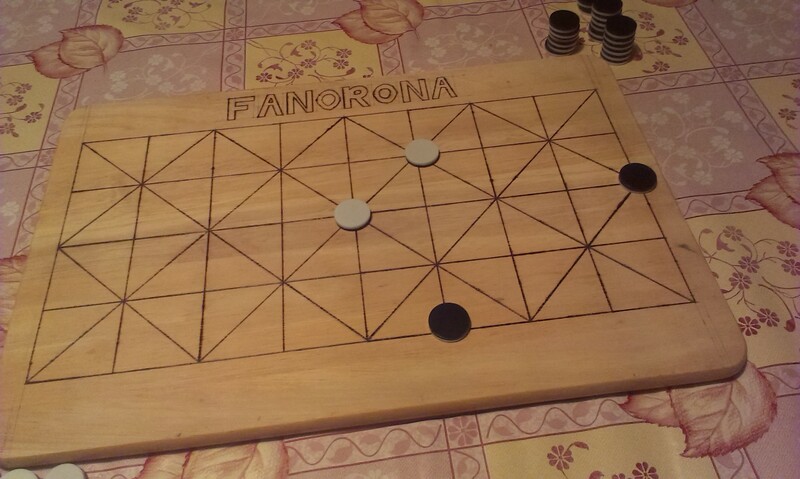 Fanorona is a strategy game, but, like Go, it’s considered a one-off. Not part of any other family of games. It is believed that it was developed from the game Alquerque, which is most commonly played in Arab countries and may date back more than 3,000 years. 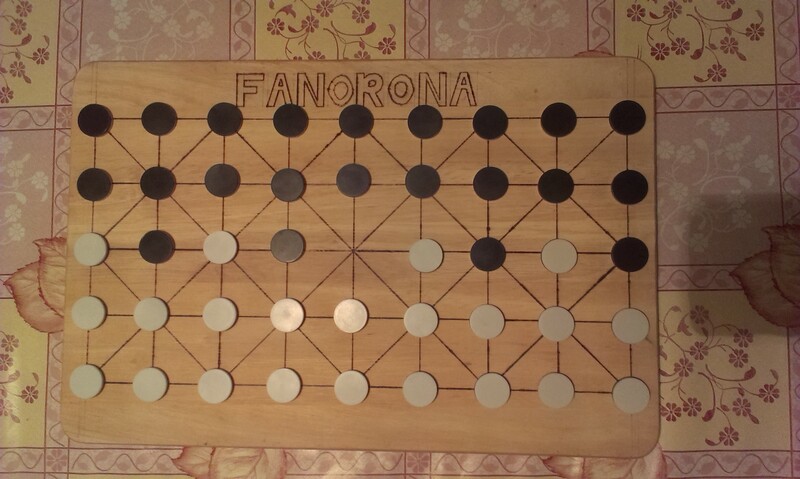 Fanorona comes in three varieties – Fanoron-Telo which appears to be identical to Three Mans Morris (another on the list of Games We Want) – Fanoron-Dimyand the board for which is identical to Alquerque – and Fanoron-Tsivy, more commonly known as Fanorona and the most well-known version of the game. It’s the national game of Madagascar and is so important there that they have a National Committee for the Coordination of Fanorona and an International Fanorona Society. The only recurrent story I can find involving Fanorona is the following about a King called Ralombo. He was sick and trying to decide what would happen to his Kingdom when he died, he did not want to divide the Kingdom between his two sons, so he sent for both of them. He reasoned that the son who arrived first was the most loyal to him and should therefore inherit the Kingdom. His oldest son was engaged in a game of Fanorona when the messenger came and was in a situation called telo noho dimy, a very difficult situation involving three pieces against eight. He was so absorbed in the game that he sent the Kings messenger away. He did not arrive at the castle until the following day, by which time his younger brother had already inherited the throne. 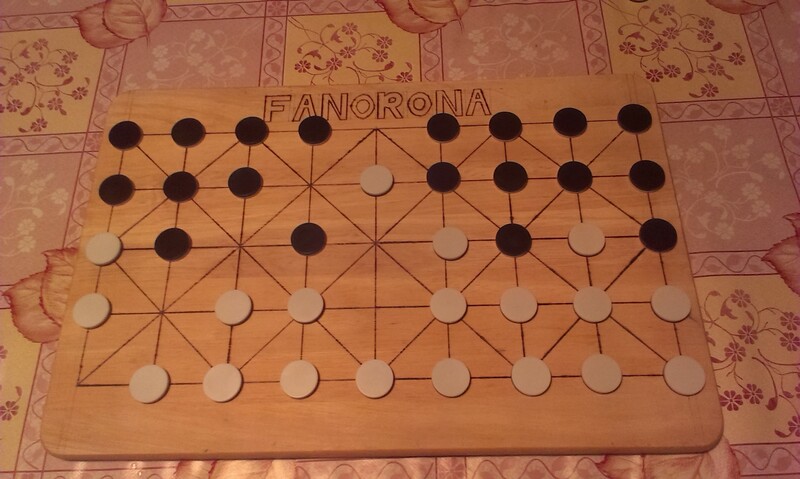 I reach point six and find that, given the limited history that is known about Fanorona, I have nothing left to write, so pretend that this is ten points, and keep reading to find out about the rules and game play!! 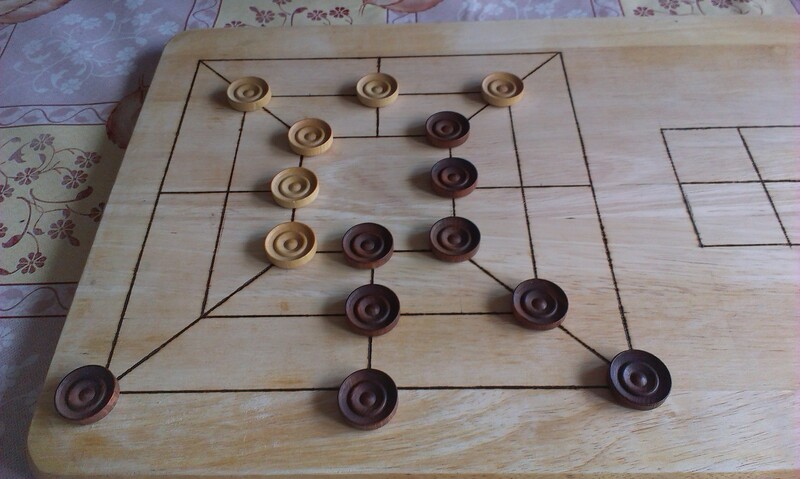 Black and white playing pieces are used for this game, they are set up as shown in the picture below. There is one space left empty in the middle of the board, which allows white to make its first move. 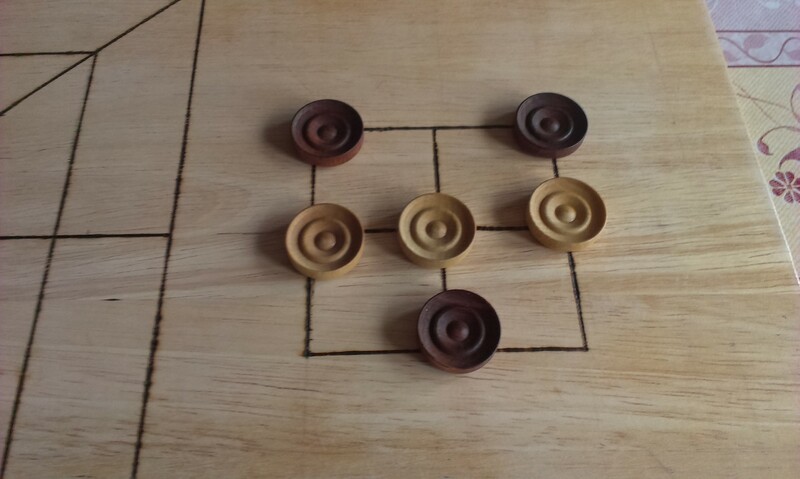 These pieces we stole from a copy of Reversi (more commonly know as Othello) to go with our home made board. 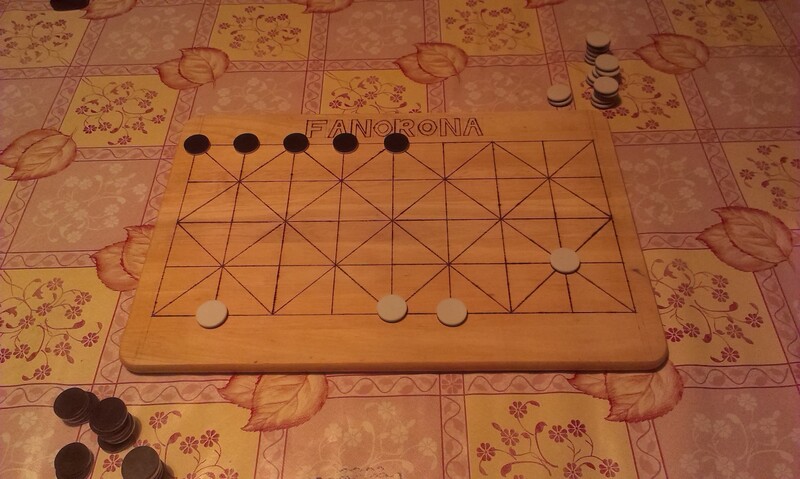 The starting set up of Fanorona on our home made board using Othello pieces. Anyone who’s familiar with Draughts will understand when I say that the game progresses quickly due to the compulsory taking rule. Also like Draughts, taking moves can be linked. A player can continue to take pieces with the piece they initially moved that turn for as long as there are legal moves available. The nature of the game is sacrificial, for the game to progress each player must lose a large number of their pieces. 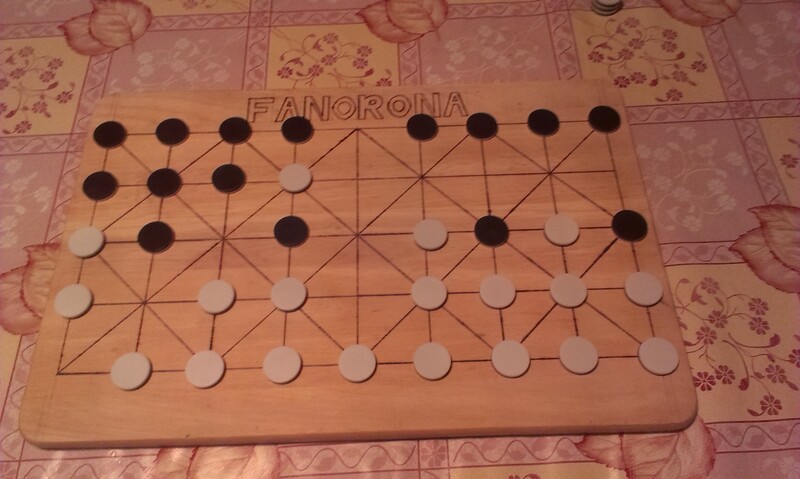 To take a piece in Fanorona a player must move one of their pieces either towards or away from the piece(s) they wish to take on a horizontal, vertical or diagonal line. The player then removes the pieces they have taken on that line up to the point where there is a gap between pieces. The starting position of a taking move. The white piece then moves forward to take the black piece in front of it. It then moves to the left to take the line it moves away from and that is the end of its move chain. Initially the game should progress very quickly, with each player taking multiple pieces each turn. When the board begins to empty, the rate of game play should slow as each player will have more options to choose from and cannot afford to be reckless with their remaining pieces. The remaining pieces on the board after only a few minutes of play. The objective of the game is to either eliminate your opponents pieces from the board or force them into a situation where they cannot move. If either of these situations arises you win the game. If you reach a point where neither player can move or take another players piece the game comes to a draw. Once you’ve played maybe, twice, the game becomes easy and can be played in well under 20 minutes. After grasping the initial rules about moving and taking it is then only strategy that remains to be developed by anyone wishing to play regularly. The game close to the end as black finds itself backed into a corner. White is the winner having removed all of the black pieces from the board. 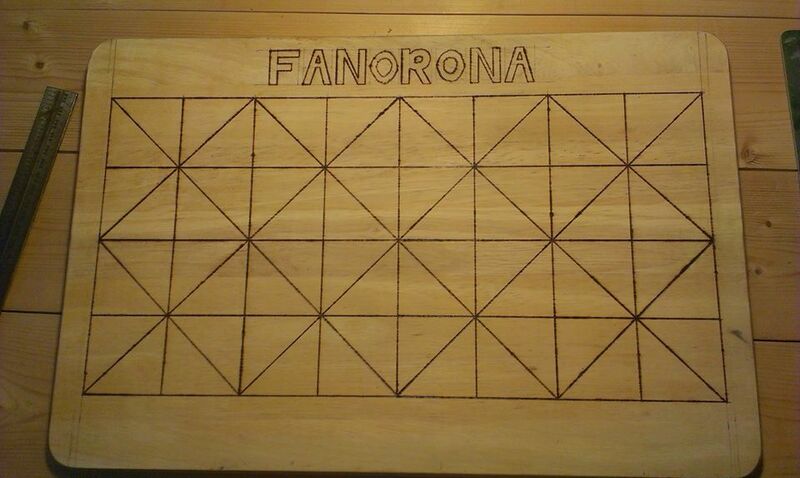 There will be another Fanarona post going up in the next few days where my brother shows you how he made the board and how you can make your own if you like. Considering that buying copies of this game appears to be rather expensive. For anyone interested, I read about the history of the game here.